Your shoes offer you a lot of protection and honestly you don’t see many modern day human types running around without them, but your socks offer most protection. Technically your socks simply protect you from your shoes. Sure they wick and absorb sweat but your feet probably wouldn’t sweat in the first place if you didn’t wear shoes. There are a lot of human cultures today that still don’t wear shoes and socks. Generally you’ll only find them in places where there aren’t many modern day inventions like shards of broken glass, gravel roads, pieces of sharp metal lying around and other newly shattered inventions. Sure if you run around in bare feet enough you will build up a thick layer of skin on the bottom of your feet but they will only take so much abuse. I know a couple of people who run around without socks and just wear their shoes. The problem with that is in the long run the friction it creates will eventually effect your feet. Your socks in a nutshell protect you from your shoes and wick away moisture from your feet. Plus socks actually have a duel purpose of protecting your shoes from your feet. So what is the best kind of sock to wear? Cotton socks are strong but don’t hold up long after a lot of washing, not very elastic and terrible at wicking moisture. They will fail to hold their shape and terrible at friction control. They are the least expensive and easy to find but should be avoided. Wool socks are great at absorption while synthetics are great at repelling it. The drawback to wool though is that it shrinks which is a bad thing not only when you wash it but the foot perspires heavily. At rest the average foot produces over ten gallons of sweat per year. Tough on wool and just imagine what it does to your nice leather shoes. When it comes down to it your best choice is a blend of fabrics. We like cotton, polyester, and a touch of elastic. The amounts will be up to you to fine tune on your own. Most people couldn’t answer this question. 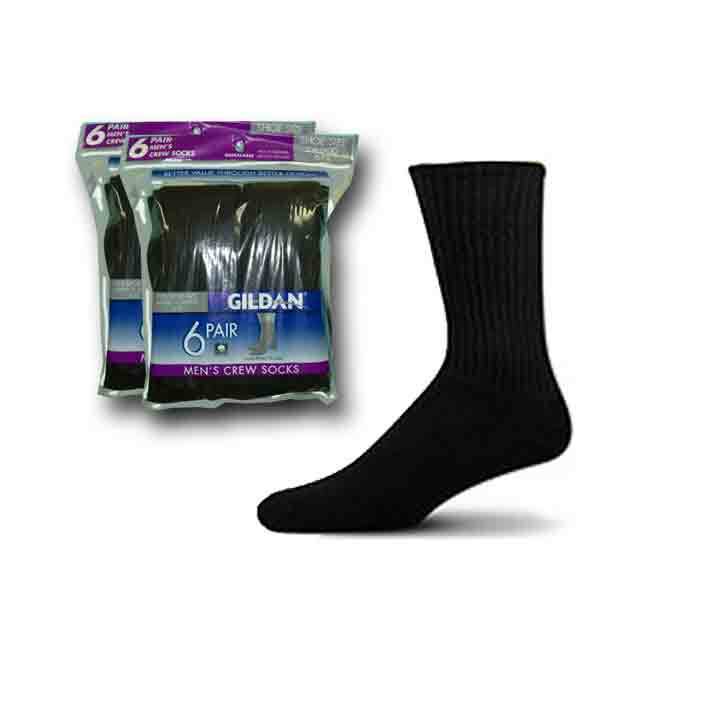 We sell Gildan Brand Crew socks fir $30.99 including shipping. It’s a famous brand, quality crew sock. It just happens to be the sock that I wear almost all the time. They fit just right and are extremely comfortable and durable.Now check this out. It’s probably pretty rare to send you to another site but go to blacksocks.com and check out their prices. What do you think about only three pair of black crew socks for $30.00. We give an additional 9 pairs of socks for only 99 cents. Not only that but we have a special running now so you can save $10 by ordering anything else on our site. Have visiting Aliens lost their socks? Could it be that these socks belonged to a visiting alien? Can you imagine what the creature looked like? How many toes, maybe two big ones or two groups of three? Were they friendly or did they just leave their socks laying around.